My family has quite a few minor skin issues. It started 5 years ago when our oldest child was born and developed a case of infant Eczema. As a mother, nothing breaks your heart more than seeing your child with a rash that won't go away easily. It seemed I could treat her symptoms and give her relief with creams and lotions but that would not take the problem away completely. My second child was born and his skin was perfect...still is. When Isaac was born he developed a pretty severe case of Eczema and it was predominately in the crease behind his ears. It was AWFUL. Red, weepy and crusted over at times it was obviously an irritant to him and made me feel horrible. He then developed a mysterious pimply rash on his face and the Eczema spread to his hands and legs. The only thing that really helped him was cortisone based creams...as much as I am not a steroid fan, these types of creams worked wonderfully. Now that I have my children's skin issues under some type of control, my husband started with very itchy rashes on his legs. We have tried to eliminate things diet and environmental-wise but nothing seems to take it away completely. Truly a mystery. My hands have had blisters under the skin for about 2 weeks now and they are itchy...most likely some sort of Eczema too. Bleah. Our family truly has a wide spectrum of issues going on here and I am more than ready for something to work on all of us! Zim's® started over 60 years ago with the creation of Zim's Crack Creme® by a pharmacist in Austintown, Ohio. Today, the Zim's® brand has expanded to over 25 products ranging from lotions and cremes to pain relief gels and diabetic care items. The Zim's Max-Freeze® brand provides an affordable topical pain relief gel that emphasizes the use of natural ingredients such as Ilex Flower and Aloe Vera. Zim's® continues to offer exceptional naturally-based products from a small town in Ohio. We look forward to expanding more in the future to provide you with products that utilize the power of natural ingredients to a make a difference in your life and those you love. 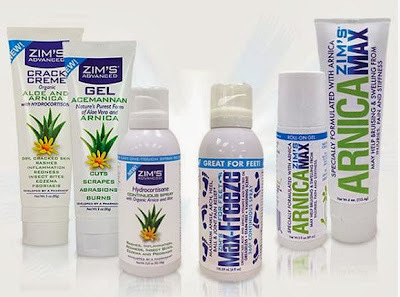 Zim’s Arnica Max provides temporary relief of minor aches and pains of muscle and joints. As you can probably guess, I was very excited about and interested in the Zim’s Advanced with Hydrocortisone Spray. So, for this review I was sent a bottle of this spray and was really happy to show it to my husband in hopes that it would help him with his legs. This spray is directly intended for the temporary relief of itching associated with minor skin irritations, and rashes due to poison ivy, poison oak, sumac, insect bites, detergents, jewelry, cosmetics, soaps, seborrheic, and dermatitis.Without really knowing what is causing my husband's leg rashes, it was nice to have a product that covered all of these problems. This spray comes out very fast and covers a pretty large portion of skin. The day I received it I had my husband give it a try but because his legs contain many open wounds, it stung pretty badly. He tried it again a week later and still got the same result so unfortunately, I cannot get him to use it. HOWEVER, I have been using it on my hands with great success. It seems to take away the itching almost instantly and has no overwhelming odors or greasiness that would cause me to discontinue its use. I have not yet tried it on my children but plan to sometime in the future. For now, I will continue using it on my hands and hope that my blisters clear up soon!! 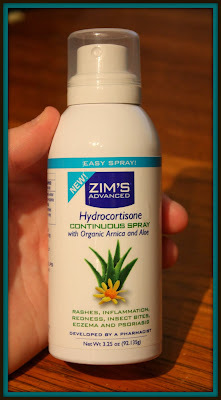 Zim’s Advanced with Hydrocortisone Spray retails for $14.99 and can be purchased directly from Zim's or at major retailers across North America. Zim's can also be found on Facebook and Twitter so please be sure to stop by and visit them there as well. Disclaimer: I received no monetary compensation for this post. I did receive free products as compensation for this post. All quotes and stock photos are from the sponsor's website and email. Prize is being provided and shipped by the sponsor. This blog is not responsible for lost, stolen or damaged prizes. All thoughts and opinions are 100% mine. Another product I would like to try for my sore shoulder is the Max-Freeze Roll-On. I would like to try this product-Formula for Diabetics and Other Dry Skin. The max roll on would be nice. I would like to try the max freeze continuous spray. I would like to try the Arnica Max Roll-On.